Sometimes, we may have the scenario like the same DAM asset is referred from multiple sites and cached locally(site specific) in Adobe Experience Manager(AEM) dispatcher for the different sites. The local cache of the different sites should be invalidated whenever the asset is modified. This post will explain how to achieve the above mentioned scenario. Add the listener for the widget and use the below script. The below exception will be thrown most of the cases while accessing the servlet with post from Adobe Experience Manager(AEM). 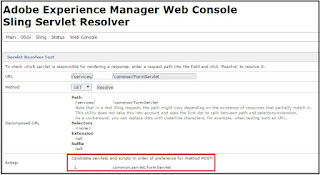 The actual issue is Adobe Experience Manager(AEM) could not ale to resolve the servlet and assumes it as a resource path but this is not a valid resource path, the below exception will be thrown when AEM tries to set the property values. Caused by: org.apache.sling.api.resource.PersistenceException: Resource at '/services/formservlet' is not modifiable. 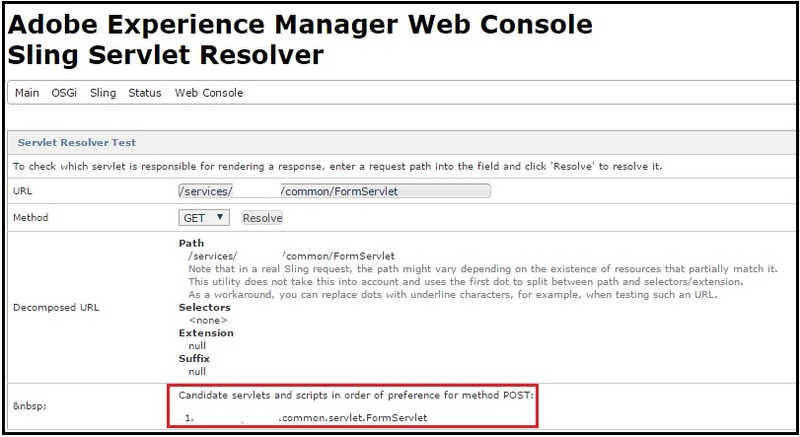 Go to http://<<AEM Host>>:4503/system/console/configMgr - Sling--> Sling Servlet Resolver and resolve the servlet path, if the servlet path is resolved then there is no issue if not the servlet is not configured properly. 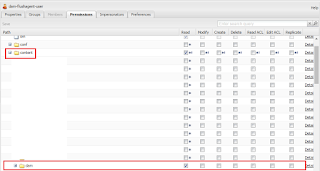 This post will explain the approach to invalidate the cache for particular site in multi site configuration - Adobe CQ5(AEM). Recently, i was working on a dispatcher caching issue with multi site configuration - The cache was not getting invalidated in all the dispatcher. The setup is with multiple dispatcher connected via load balancer. The load balancer will route the request to individual dispatchers via round robin algorithm. The dispatcher is configured with individual virtual host and farm for every site(Load balanced DNS is used). The flush agent was configured in publisher for every site with load balanced DNS(the flush agent was equal to number of sites configured in dispatcher) - The issue here is when ever publisher send the invalidation request that is not reaching the corresponding dispatcher as the flush agent is configured with load balanced DNS for invalidation URI - The request will be send to random dispatcher from the load balancer due to this the cache will not be invalidated in all the dispatcher. 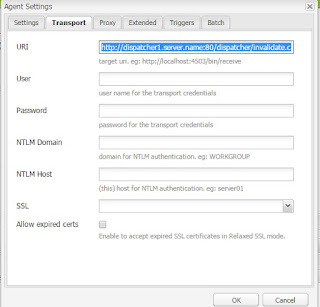 http://<<AEM Host>>:<<AEM Port>>/crx/explorer/ui/search.jsp - Paste the query and click on Search Now. We are having multiple blogs around this but could not able to find the complete information on this. Thought of sharing this for my reference too. This post will explain how to integrate Jenkins in Linux with private GIT Hub. Make sure Jenkins GIT Client Plugin and Jenkins GIT plugins are installed. Enter the details accordingly, Passphrase is optional if required then enter some string. We were receiving the following error in run time due to this the pages got broken. The same scenario was working fine earlier and broken without any code or config change to the server. 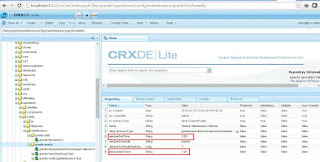 We could not able to identify the root cause but as a work around manually added a space to the component and saved through CRXDE and that helped to fix the issue. Adobe Experience Manager(AEM) 6.1 will have daily job scheduled and that will perform the online compaction. Some times this may cause performance issue when the online compaction takes more time to complete due to load or authoring. As a solution the online compaction job can be disabled and offline compaction can be used whenever required based on the maintenance window. Based on the analysis, the issue happened due to in sufficient space in the server. The deployment got success after freeing some space in the server. 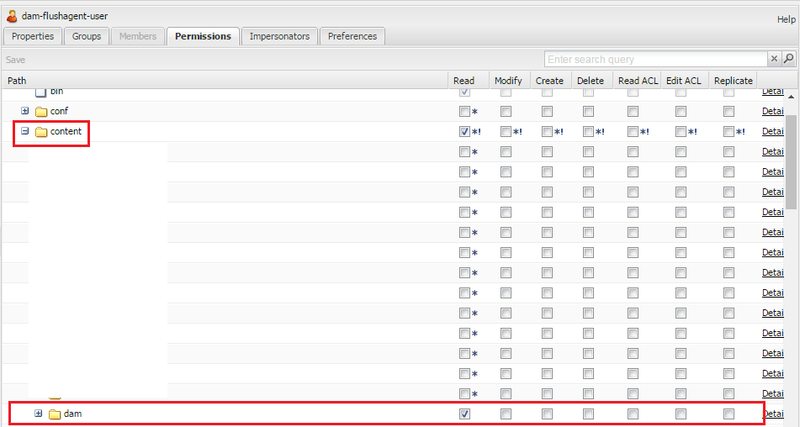 How to modify the scheduler time for daily and weekly maintenance jobs - Adobe Experience Manager(AEM) 6.1? 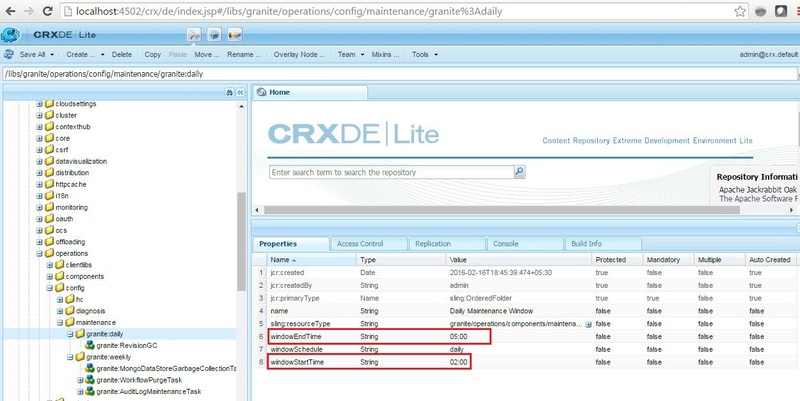 This post will explain the steps to modify the scheduler time for daily and weekly maintenance jobs in Adobe Experience Manager(AEM) 6.1. Change the windowStartTime and windowEndTime accordingly to change the schedule time of the job. 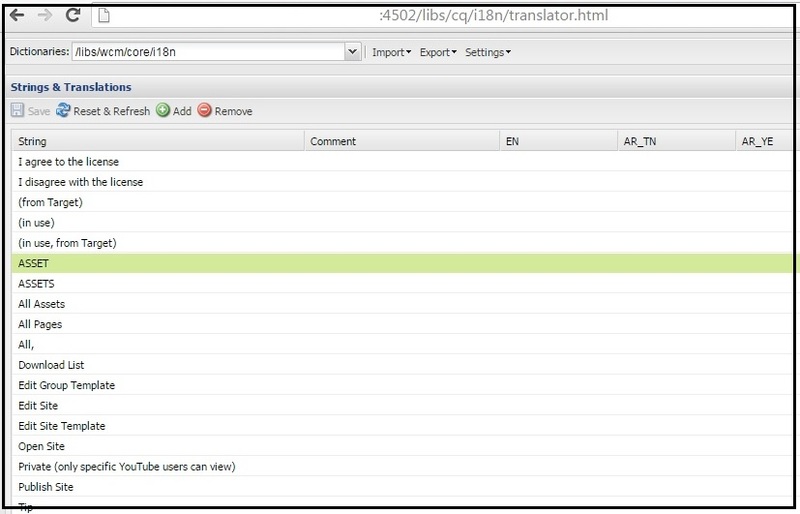 Follow the below URL to create the i18 language nodes for first time. 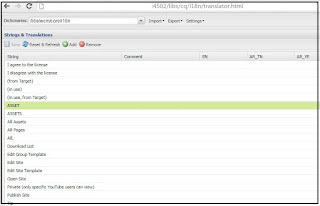 The translator.html can be used to manage the i18 translation for different languages. Here you can add/delete modify keys and language values. 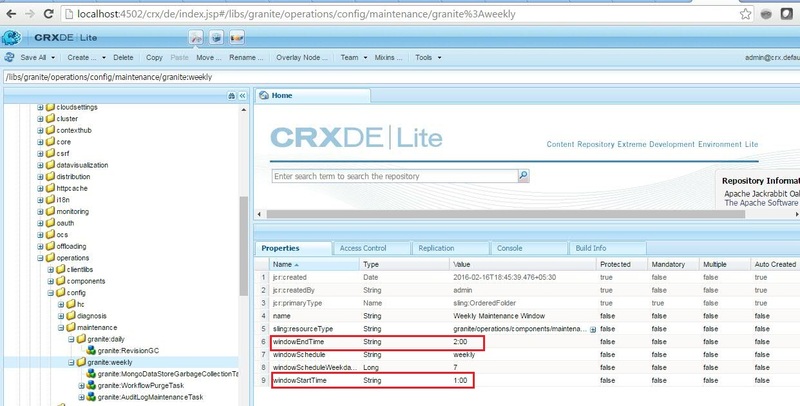 Whenever we perform any operation the same can be viewed from CRXDE – under the language node created as part of the first step. Some cases we may need to index specific type of URLs from the website and excluding all other URLs available. The URL Masks can be used in Adobe S&P to achieve this. 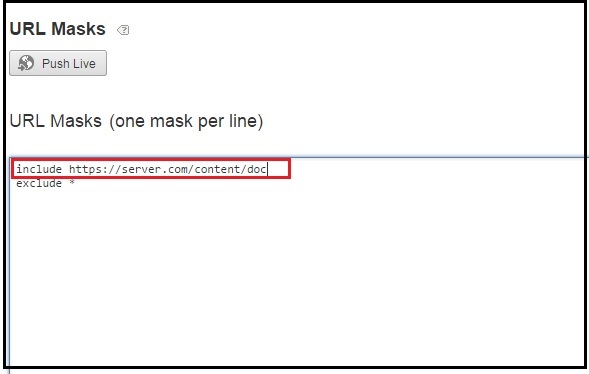 URL mask will help us to define the rules to include or exclude the specific URLs during the indexing. Exclude - pattern that specifies the URLs will be excluded from the indexing. 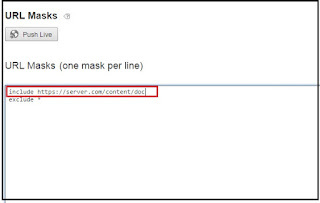 To index the URLs that is starting with mask. 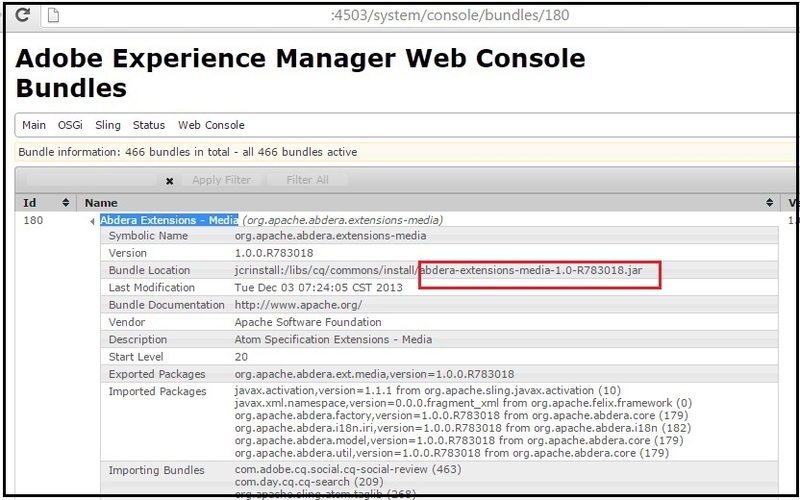 Sometime when we are deploying the packages, the JSP classes will not get compiled automatically in Adobe Experience Manager(AEM) 6. We can follow the below option to clear/recompile the JSP classes. 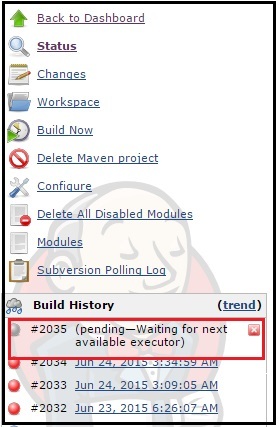 While we were trying to execute the job, it was displaying "Pending - Waiting for next available executor". When looking into the Jenkins node from the console, the Master node is offline and the error message displayed was "Disk space too low. Only xxxGB on /tmp" but the /tmp folder has space around 1GB. 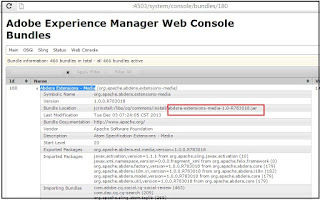 By default anonymous user in Adobe Experience Manager(AEM) will have the read access to content, so the content can be accessed via dispatcher/publisher directly without providing any credential. 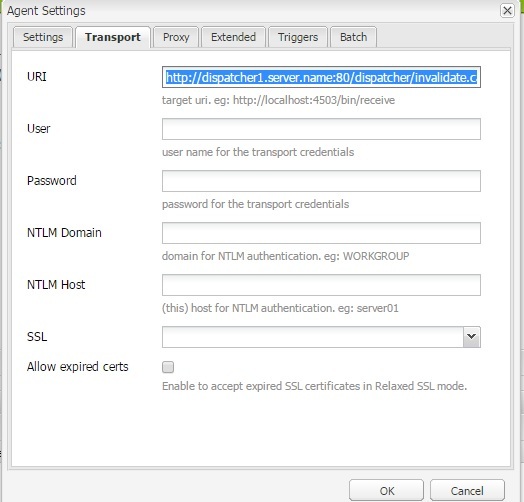 This blog will explain how to restrict the content access to only authenticated users via dispatcher(including cached content) and publisher. AuthName "Please login to access the site"
AuthName "Please login to access the press release"
There is a another scenario, separate credential for particular directory and rest of all the directories will use the same credentials. I was receiving the following exception "send-mail: fatal: open /etc/postfix/main.cf: No such file or directory" while trying to send the mail through cron job. But the main.cf file is available in the specified location /etc/postfix/main.cf. I tried providing the complete permission to /etc/postfix/main.cf but this not resolved the issue. 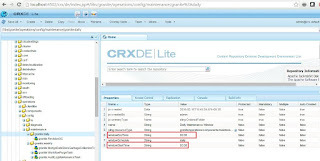 We were not able to access the useradmin,siteadming and other website pages in one of our AEM/CQ5 publisher but was able to access the crxde and system console. After analysis the issue is due to some of the bundles were stopped(100+), we tried to start those bundles manually without any luck. The following was the exception in the log file. This error points to missing package of org.apache.abdera.ext.media and this belongs to the bundle - Abdera Extensions - Media. After looking into the system console, the bundle is not there and it got uninstalled(not sure how it got uninstalled). Follow the below steps to resolve the issue. Identify the bundle id from another environment.